You have been diligently checking your USCIS case status online for the past few months. 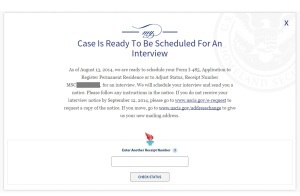 For a while now, the case status has reflected that USCIS is “ready to schedule your Form I-485, Application to Register Permanent Residence or Adjust Status, Receipt Number ABC1234567891, for an interview.” On November 11, 2014, you go online once again, and are surprised by the website’s new look, which now includes an “upgraded” Case Status tool. 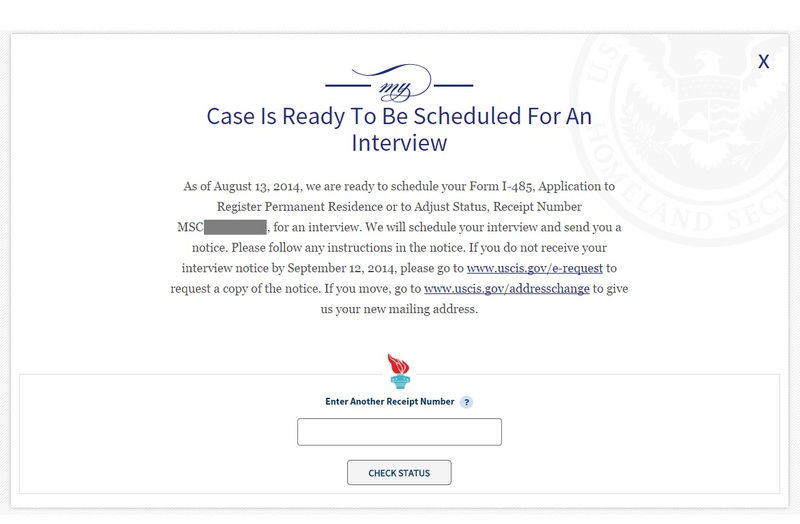 To your dismay, your case status now states “If you do not receive your interview notice by September 5, 2014, please go to www.uscis.gov/e-request (https://egov.uscis.gov/e-Request/Intro.do) to request a copy of the notice”!!! Now you are really freaking out. Since when have I had the option to file an E-Request and inquire about my interview notice? Do I have to file an e-request? What if USCIS did send out a notice and I didn’t receive it? It sounds like they did, otherwise why would they be telling me to request a copy of the notice? At this point you either call your attorney and ask them to file the E-Request on your behalf or you go ahead and file one on your own. USCIS will review and process the request. Your attorney or you receives an email from USCIS-CaseStatus@dhs.gov with the same information. You have been frenetically checking your inbox in the days leading up to December 3rd, but to no avail–USCIS failed to respond to your request by their self-imposed deadline. Today is December 17, and you have still not received any reply from USCIS. Back to square one. If you had me as an attorney, I would have told you not to hold your breath. 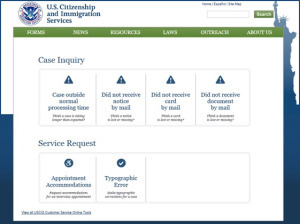 We had a few clients call with the above questions right after USCIS unveiled a new look to its website and additional features, including the upgraded Cases Status and E-Request tools discussed above. While sleek-looking and user-friendly, these tools are completely useless if they don’t do what they promise to do. User-friendly, yes. Efficient, not so much. I wouldn’t worry too much about the “deadlines” for filing E-Requests. These seem to have been automatically computed from the date of last action on the case. I would especially not worry if you have an attorney on the case, and he/she has also not received an interview notice. Looks fabulous, but can be highly misleading. 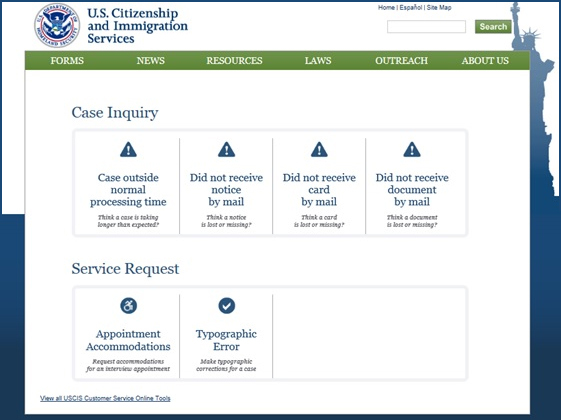 Shortly after the USCIS website unveiled its new look, it went down for nearly a full day. They have significantly improved the speed of the website, but it’s clearly still a work in progress. In light of these ever-changing circumstances, take what you see online with a grain of salt. You might be better off just speaking to a USCIS customer service representative.